+ Do you accept Credit/Debit cards? No. As of January 6, 2018, we no longer accept credit or debit cards for payment. We accept Cash or Check with proper I.D. Out of state checks must be pre-approved by Cozart Auction Services. + Do you perform background checks for firearms purchases? Yes. 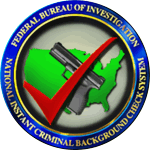 We are required by federal law to perform background checks on all persons who wish to purchase firearms. + Do you guarantee items? No. All items up for auction are sold as-is. You are free to inspect the item anytime before it is sold. + How do I know what time an item will be auctioned? Generally, only real estate has a specified time of auction. During the auction, we normally move along the items in an orderly fashion so you can see when we are approaching the item you're interested in. It is your responsibility to follow along with the auction if there's an item you are interested in bidding on. + Can I give you some items to sell? Yes. We do auctions where there are multiple sellers items called Consignment auctions. These are normally held at an indoor climate-controlled location where we can accept credit cards and perform background checks for firearms sales. Please contact us to see when we will be having our next consignment auction. + How much does it cost to have you sell my items? We offer some of the most affordable auction rates anywhere. Rates vary for different types of auctions, so please contact us for more information about your specific needs.